The Huffington Post is reporting that Donald Trump is workshopping nicknames for his political opponents. In 2016 Donald Trump’s nicknames were devastating. Lyin’ Ted Cruz, Little Marco Rubio, and perhaps the most potent, low-energy Jeb Bush, all stuck and spelled trouble for his opponents. This time around, one nickname, Pocahontas, has offensively summarized the most challenging personal scandal Elizabeth Warren has faced in her political career. While some of his nicknames like Lyin’ Ted, and Crooked Hillary painted a narrative that Trump desperately wanted the public to believe about his opponents, the most effective nicknames pinpointed or summarized a characteristic that the opponent did seem to possess. Then, once a nickname was settled on, Trump repeated it over and over and over again. Surprisingly, no one has made a similar nickname stick for Donald Trump. 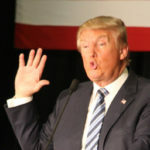 While most Democratic candidates will be eager to separate themselves from Donald Trump’s style and approach, there is no doubt his one or two word nicknames play well in the media and effectively conjure an image that is hard to overcome. I believe the best way to combat this is to assign Trump with his own nickname, equally as effective and encapsulating. My favorites include one given to him by the Southern District of New York: Individual-1. I also like one of my own creation: Indentured Don. Leave your own ideas in the comments. Rather than waiting for the Democratic candidates to nickname Donald Trump, we can give him a true grassroots nickname, courtesy of the Palmer Report!